Three days after Johnny Bobbitt Jr. was sentenced for his role in a GoFundMe campaign that netted $402,706 and defrauded donors with a fake Good Samaritan tale, Katelyn McClure appeared before the same judge in Superior Court in Mount Holly to admit her role in a conspiracy that preyed on people’s sympathies. McClure, 29, of Bordentown, pleaded guilty Monday before Judge Christopher Garrenger as part of an agreement that calls for her to face a four-year prison term. McClure admitted that she and her ex-boyfriend, Mark D’Amico, befriended Bobbitt, 36, a former homeless veteran, outside a Philadelphia casino. She said the couple then made up a story about Bobbitt’s offering her his last $20 when she ran out of gas off I-95 in Philadelphia, in an area where he had been panhandling in November 2017. Johnny Bobbitt gets probation in $400K GoFundMe scam. Federal charges could still send him to prison. She said D’Amico, 39, of Florence, told her that “this was for Johnny and if I did it, it would help Johnny out.” She said she and D’Amico had given Bobbitt money when he was panhandling and even brought him small gifts. 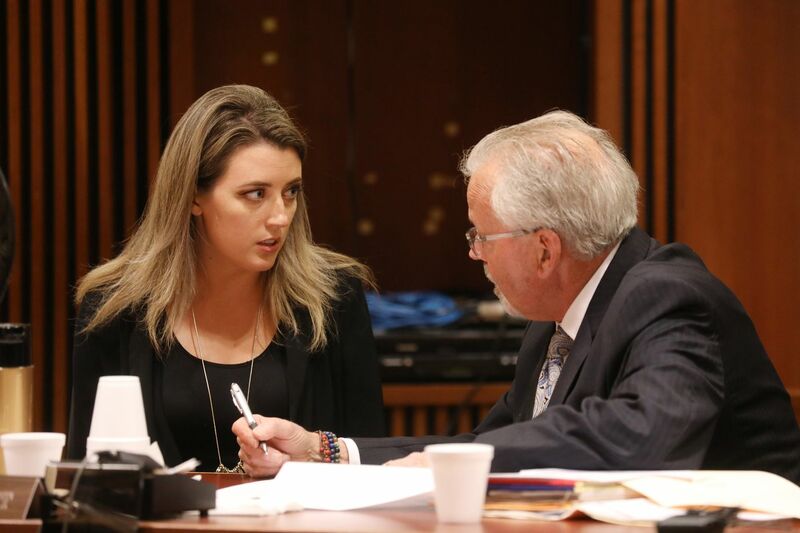 Under McClure’s agreement with county prosecutors, she admitted to a single charge of theft by deception, which would be downgraded to a third-degree crime. In return, a conspiracy charge would be dropped. She also agreed to testify against D’Amico and Bobbitt, and to cooperate with authorities. Sentencing is scheduled for June 3 in the Burlington County courthouse. More than 14,000 donors across the country and beyond contributed to the GoFundMe campaign and were led to believe the money would be used to help get Bobbitt, who served in the Marine Corps, off the streets. The three appeared on national TV and radio shows to promote their Paying It Forward campaign, which went viral over the holiday season. She also admitted that she video-recorded Bobbitt as he sat in her car and heard about the GoFundMe campaign the couple had launched. She said he never told her to terminate the campaign. McClure arrived at the hearing with her parents and was dressed in black, as she was when she pleaded guilty to a conspiracy charge related to the scam in federal court in Camden six weeks ago. She admitted Monday that she and D’Amico spent much of the money that was raised on vacations, casino gambling, a BMW, two trucks, designer handbags, and other purchases. Bobbitt lived for a short time in a camper next to the couple’s home in Florence, and used some of the $25,000 he received from the couple for illicit drugs, she said. She admitted she dropped him off near “a side street in Philadelphia” and assumed he made these purchases, but never actually watched. Johnny Bobbitt sits in the courtroom with his attorney John Keesler, right, as he is sentenced to a drug treatment program and five years of probation after his involvement in what prosecutors say was a nationwide crowdfunding scam at Burlington County Superior Court in Mount Holly. D’Amico has also been charged by Burlington County prosecutors with theft by deception and conspiracy..
Assistant Burlington County Prosecutor Andrew McDonnell said the state would not “take any position” on the sentence beyond the plea agreement, and would defer to the court’s pre-trial team. He also said the plea agreement called for McClure to pay more than $400,000 in restitution to GoFundMe, which refunded donors’ money after authorities announced the fraud. McDonnell said McClure’s repayment would “be subject to her ability to pay.” He also said her sentence could run concurrently with the sentence a federal court might impose in June. McClure lost her job with the state after she was charged by prosecutors. Last month, McClure pleaded guilty to one charge of conspiracy to commit wire fraud in federal court for her involvement in the scheme, which included interstate banking. She is scheduled to be sentenced on that charge on June 19 in U.S. District Court in Camden. Kate McClure walks out of US Courthouse in Camden next to attorney, James Gerrow, and her parents after pleading guilty to being a co-conspirator in a $400,000 GoFundMe campaign scam on Tuesday, March 6. McClure’s plea in state court came after Bobbitt, a longtime drug addict, was sentenced Friday to five years of special probation that requires him to enroll in a court-supervised live-in drug rehabilitation program. If he fails to complete the program, he could be sentenced to five years in state prison with 18 months of parole ineligibility. He also agreed to testify against McClure and D’Amico at trial. County Prosecutor Scott Coffina said Friday that Bobbitt was being transferred from the Burlington County Jail to a drug treatment facility that he declined to name. Bobbitt also was prosecuted by federal authorities and faces an additional six to 30 months in federal prison on a charge of conspiracy to commit money laundering, under his plea arrangement. That term could be concurrent or consecutive to the sentence in state court. Federal prosecutors have declined to say whether D’Amico may be charged or whether he is under investigation. He has not responded to requests for comment. The Paying It Forward campaign was posted online on Nov. 10, 2017, by McClure. The initial goal was to raise $10,000 with the goal of providing Bobbitt with money for rent, a vehicle, and six months of living expenses. Johnny Bobbitt Jr. (left), Mark D'Amico, and Kate McClure at the CITGO station where Bobbitt spent his last $20 to buy gas for Kate. But donations poured in, totaling hundreds of thousands of dollars. Within nine months, all of the money was gone. Bobbitt sued McClure and D’Amico last summer, saying he didn’t get his share of the money. That lawsuit caught the attention of authorities. After an investigation, that civil case was put on hold and the three were charged with conspiracy.